Let's face it, I've drastically lost interest in Record Store Day the past few years. It's not so much that I lost interest in waking up at 3am or standing outside of a record store for 5 hours before it opens, but the releases themselves haven't been very interesting in a while. You've got your lazy cash grab reissues and your overpriced exclusives. Bands that I care about seem to be giving up on the day, so my enthusiasm has waned. I could say similar things about Against Me. Since the album New Wave, I've been losing interest. Each record being less engaging than the one before. It's not to say any of them are bad, they're not and I own them all, but I don't really go back to them repeatedly like the first few. So many bands get like that after a while so it's even not a criticism leveled exclusively at Against Me. Nonetheless, it really felt like I was just going through the motions when I went over to Vintage Vinyl at the crack of four pm this year and picked up this record. 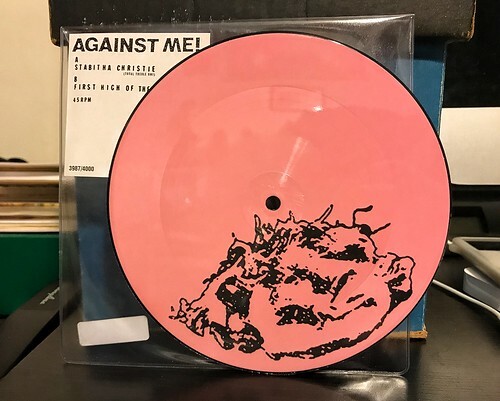 That being said, this Against Me Record Store Day 7" is pretty good all things considered. Despite it's stupid song title, "Stabitha Christie" is a bouncy little song with an old time rock and roll bassline and a surprisingly poppy hook. To the surprise of no one, I have always gravitated to the poppier Against Me songs. B side "First High of the Morning" isn't quite as strong. It's a little slower and more reflective, but it's totally fine. Worth a nine dollar picture disc? That's debatable, but there's a better chance of me going back to this 7" than some of the other Against Me records in the pile.